After three days of skilled Pot-Limit Omaha play, Event 11 of the World Series of Poker has came to an end. Some 970 players entered the tournament and only nine returned for the final day. 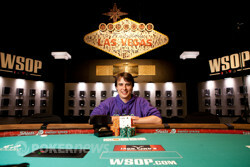 Dutchman Vincent Van Der Fluit has claimed his first gold bracelet and $265,211. The final table was an international affair and returned players from five different countries. Tristan Wade was the only returning WSOP bracelet winner but he had stiff competition with high stakes player Van Der Fluit. 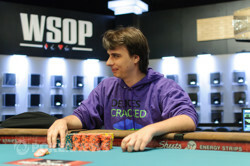 Charles Tonne returned as the chip leader for the second day in the tournament. 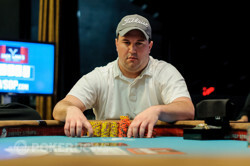 The first casualty of the final table was David Schnettler. He was one of the returning short stacks and found himself facing a call for his tournament life on a flop of . He called and Alex Dovzhenko had flopped the nut straight. Schnettler held and needed some help from the deck. It would not come when the board completed with . Just ten minutes later Calvin Anderson found himself all in on a flop of . Dovzhenko called holding trip sixes and Anderson was on a club flush draw. 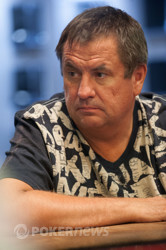 The turn gave Dovzhenko a full house and Anderson was sent to the rail in 8th place. 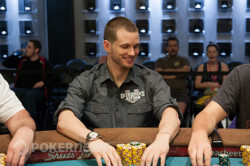 The lone Canadian at the final table, Brian Garbe, entered the final table with the shortest stack. Tonne opened from under the gun and Garbe made his final stand and shipped it in holding . Tonne called holding and the board ran . Tonne's two pair sent Garbe home in 7th place. The quick action kept pace when Rodney Brown moved all in just 15 minutes after Garbe's elimination. The flop was and Van Der Fluit snap-called tabling two pair with . The turn gave Van Der Fluit a full house and Brown exited in 6th place. Dovzhenko had been the most active player at the table and his luck would run out when he got involved with Tonne. They saw a flop of , Dovzhenko potted and Tonne re-potted. Dovzhenko was all in with a pair of aces. Tonne flopped two pair and turned a full house. The Russian would leave in 5th place. There was a half hour breather between the next elimination, giving the frantic pace a pause. On the first hand returning from a break Lhommeau got all in preflop against Tonne and Tonne made a straight, eliminating Lhommeau in 4th place. Just two hands later Wade got his short stack all in holding against Tonne's . The board ran and Wade's pair of queens wasn't enough to keep him in the tournament. He earned a little over $100,000 for his 3rd place finish. Heads up play mimicked the rest of the tournament and it was a quick affair. Van Der Fluit and Tonne started at relatively even stacks but Van Der Fluit chipped away at Tonne. In one key hand that set Van Der Fluit up for victory occurred when they saw a flop of . Van Der Fluit called to the turn and then bet 350,000 on the river. Tonne called to see Van Der Fluit flopped a full house holding . Van Der Fluit then had a three-to-one chip lead and only two hands later the match was all over. Van Der Fluit opened to 60,000 and Tonne called. After a flop Van Der Fluit was check-raised to 315,000. Then all the chips got in the middle and Tonne had only a flush draw with . 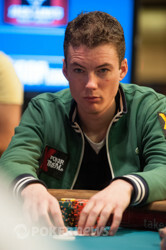 Van Der Fluit held two pair and a higher flush draw. The board completed and Van Der Fluit's higher flush sealed the bracelet for him. On what would be the final hand of the evening, Vincent Van Der Fluit raised to 60,000 from the button and Charles Tonne made the call. The flop came and Tonne checked to Van Der Fluit, who c-bet for 65,000. Tonne then check-raised the pot to 315,000. Van Der Fluit paused, then raised the pot again and Tonne went all in. Van Der Fluit called and hands were revealed. The turn sealed the deal for Van Der Fluit - giving him an unbeatable higher flush. An irrelevant landed on the river and Tonne's impressive run was put to an end. Vincent Van Der Fluit opened for 60,000 from the button and Charles Tonne called. The flop came , Tonne checked and Van Der Fluit bet 65,000. Tonne raised to 150,000 and Van Der Fluit called. The turn came , Tone bet 250,000 and the Dutchman called again. The river brought the , Tonne checked and Van Der Fluit cut out 350,000 to put in the middle. Tonne tanked for a short while and then called. Van Der Fluit tabled for a full house and Tonne mucked. Now that we are at then end of the 23rd level, all of the yellow $1,000 denomination chips have been colored up. Today, Vanessa Selbst joined the PokerNews Podcast just before her Round of 32 match in Event 12: $10,000 Heads-Up No-Limit Hold'em. She discusses some of her matches, a World Series of Poker bathroom situation and of course the carnage that was Vanessa Rousso's house-warming party. Check it out! Charles Tonne opted to open for 50,000 on the button and Vincent Van Der Fluit raised to 150,000. Tonne re-raised to 375,000 and Van Der Fluit called. The flop fell and Van Der Fluit potted for 750,000. Tonne mucked his hand and Van Der Fluit earned some chips back. Charles Tonne raised to 50,000 from the button and was 3-bet to 150,000 by Vincent Van Der Fluit from the big. Tonne flatted to see a flop, which came . Van Der Fluit continued his aggression and led out for 165,000. Tonne called. A fell on the turn and Van Der Fluit opted to slow down and check, prompting a 225,000 bet from Tonne. Van Der Fluit made the call. Van Der Fluit again checked when a landed the river. Tonne thought it over and pushed a 300,000 bet into the middle, sending Van Der Fluit deep into the tank. He eventually flung out a call and Tonne showed . "That's good," Van Der Fluit said and mucked his hand. Tristan Wade had been grinding his short stack all day and finally was able to get it all in preflop and Charles Tonne called. The board ran and Tonne's two pair eliminated Wade. On the very first hand back from break, Charles Tonne opened from the cutoff position and action folded over to Damien Lhommeau in the big blind, who announced a pot-sized re-raise. Tonne quickly 4-bet the pot and Lhommueau went all in. Tonne called and hands were revealed. The board ran out , giving Tonne a straight on the river and eliminating Lhommeau. Cards are in the air following the break. Player are now on break. Play will resume in 20 minutes. Tristan Wade opened to 60,000 from the small blind and Vincent Van Der Fluit called from the big blind. The flop came , Wade checked, Van Der Fluit potted and Wade called all in. Both players had trip eights and the turn gave Van Der Fluit a full house. The river saved Wade when it fell and Wade's full house earned him the double up. Charles Tonne opened to 40,000 from under-the-gun. Action folded around to Alex Dovzhenko in the small blind, who re-raised to 130,000. Tonne eyed Dovzhenko's stack and made the call. Dovzhenko announced, "pot," which would be a bet for 280,000. Tonne re-raised the pot and Dovzhenko quickly announced he was all in. Tonne called and Dovzhenko would be at risk for his tournament life. The turn would improve Tonne to a full house and the river bricked for Dovzhenko, who was eliminated in 5th place. 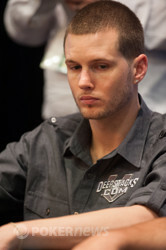 During the opening levels Alex Dovzhenko has been by far the most active player at the table. He's been opening with consistency and has two eliminations to his credit. Vincent Van Der Fluit has also been mixing it up but Damien Lhommeau has been picking his spots well. Charles Tonne, the wire-to-wire chip leader, has been fairly quiet and his stack has slipped a bit. Tristan Wade is a bit handcuffed with his short stack but the WSOP bracelet winner has won the pots he's played. He's played his short stack well this afternoon. Damien Lhommeau opened for 55,000 and Charles Tonne called on the button. The blinds released and the flop came . Lhommeau check-called 70,000 to see the turn and then folded when Tonne bet 150,000.